서울의 도시환경은 선진도시라 보기에 민망할 정도다. 불규칙한 보도블록과 지저분한 상업간판, 노점상과 포스터 등으로 몸살을 앓고 있다. 시민을 대상으로 문화도시로서 서울을 조사한 결과 시민 대부분은‘도시환경 자체가 문화적이지 않다’라고 응답할 정도다. 지저분함으로 상징되는 도시환경을 개선하고자 서울시는‘디자인 서울 프로젝트’를 추진하고 있다. 서울의 디자인을 근본적으로 혁신하여‘매력적인’서울을 만들자는 것이 정책의 핵심이다. 2007년 10개의 시범가로를 지정, 디자인을 근본적으로 혁신하는‘디자인 서울 가로 조성사업’을 추진하고 있다. 다른 한편, 도시 공간을 예술적으로 장식하는 도시갤러리 프로젝트도 추진하고 있다. 도시의 흉물인 고가도로나 가로의 옹벽, 지하철 벽면 등을 예술적으로 장식하자는 것이 정책의 취지다. 향후 서울시는 서울 전역을 대상, 새로운 디자인과 예술장식을 추진할 전망이다. Seoul's urban environment falls far short of that of an advanced nation, as its sidewalks, signboards, street vendors and posters are not kept in order. According to a survey of Seoul citizens, most respondents think that Seoul's environment itself has no cultual characteristics. In an effort to clean up the urban environment, Seoul city launched 'Design Seoul Project'. Its core concept lies in making 'attractive' Seoul by innovating the design of Seoul. 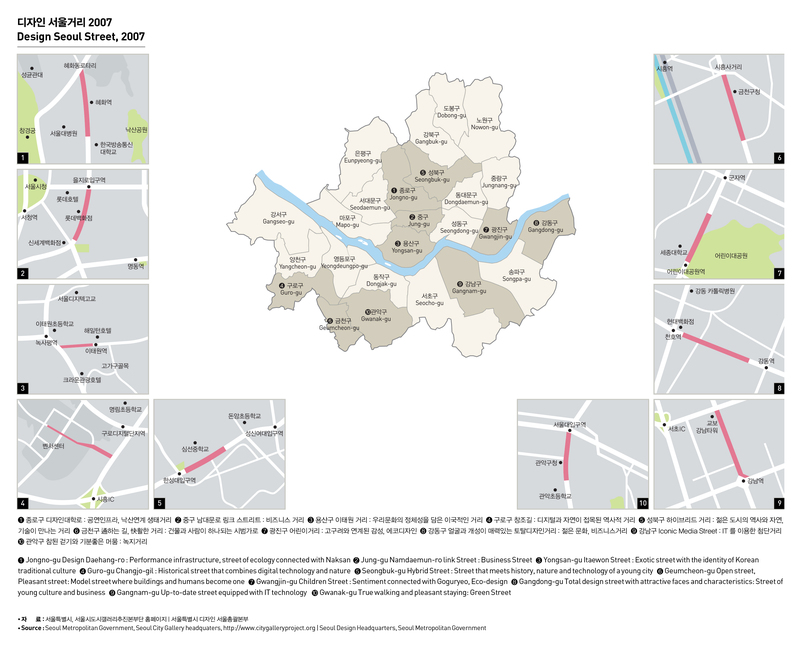 Seoul designated 10 model streets and is promoting a project to improve Seoul streets. It also pushes ahead with a city gallery project with the aim of decorating the urban environment, including an overpass, retaining wall, and subway. 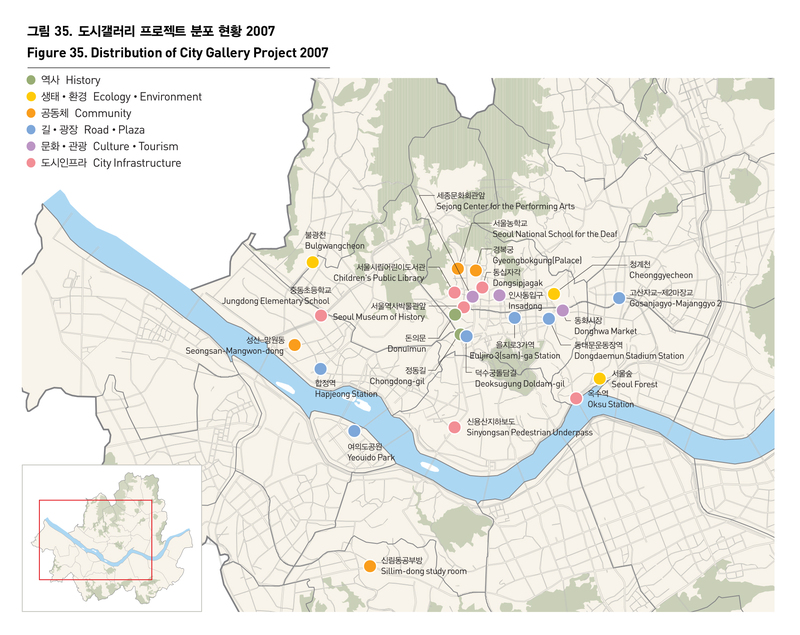 Citizens will see a new design and art decoration throughout Seoul in the foreseeable future.